Last night marked a pivotal shift in seasons... Vermont's first amphibians have awaken from their winter slumber. They were the first of many more that are yet to emerge from hibernation and move through field and forest towards their breeding pools. Spring migrations of amphibians are triggered by the first warm, rainy nights of the year. Each March and April, volunteers of the North Branch Nature Center's Amphibian Monitoring Program are ready to greet those amphibians as they monitor their populations and ensure their safety as they move across roadways. To learn more about amphibian migration and how you can help, join one of the FREE training sessions coming up this spring, the first of which is TONIGHT! 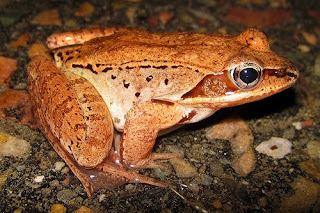 For the past eight years, on the first warm, rainy nights of spring, the NBNC has coordinated teams of volunteers to assist amphibians on their annual migration to breeding pools. All too often their journey is interrupted by roads, which can be devastating to local populations. Volunteers are trained to on how to monitor frogs, toads and salamanders at these sites and save them from becoming road kill. You can get involved by attending a training session for amphibian monitoring. No registration necessary. All programs are free. Here are some other reports of amphibian activity last night, listed by location. Thanks to Jim Andrews for collating these observations! Salisbury - 45 Blue-spotted Salamander Group, 2 Four-toed Salamanders, 1 Spotted Salamander, 12 Wood Frogs, and 3 Spring Peepers. Vergennes/Monkton area - 2 Blue-spotted hybrids, 3 Spotted Salamanders, 5 Spring Peepers, and 3 Wood Frogs. Brandon - 10 Wood Frogs (all male), 7 Spring Peepers, and 1 Blue-spotted hybrid alive, and 7 dead Wood Frogs and one dead Blue-spotted hybrid.